The Springfield hotel, Marple, Stockport is located on the edge of the peak district in beautiful tranquil surroundings, ideal for walking holidays alongside the canals and into the countryside. Conveniently situated just 5 minutes walking distance from the central train line into the heart of Manchester city centre and only 30 minutes driving distance from Manchester airport one way, and in the other direction we are only 15 miles from Edale which is in the heart of the peak district. Suited also for worldwide business guests, we offer car parking facilities and all rooms have WiFi access and digital TV channels. Kevin and Elaine are dedicated to providing business and holiday guests alike with the highest level of professional service in their warm and friendly Victorian country style home. The accommodation and service provided come with the particular attention to detail for which they are renowned. 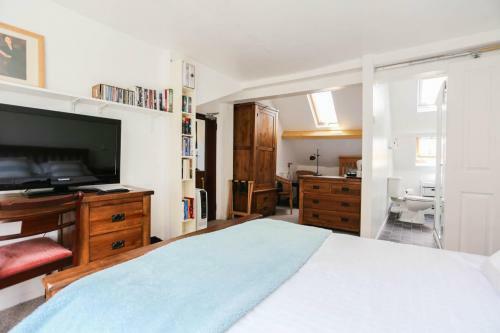 Good size bedroom with a roomy bathroom attached. Clean and comfy. The breakfast was exceptional. The choice of cooked breakfast (including Eggs Benedict and Eggs Royale) surpassed much pricier hotels that we have stayed at. Run by a real character of a host and his wife. Well worth a visit. 10 minute walk down the hill to the delightful Marple Bridge and village. I’ve stayed here a few times now and it’s always the same, a wonderfully warm welcome from the owners Kevin and his wife. I honestly feel like part of the family, we chat over a glass of wine about something or nothing, this time round Kevin even invited my elderly father for breakfast with me in an attempt to get him out of the house. I often take my bike to cycle some of the beautiful Peak District and they are more than happy to allow me to keep I safely stored in the house. Rooms are crispy clean and wonderfully comfortable. Love this place so much. Friendly, welcoming hosts, good breakfast with a varied choice of hot and cold food. Lovely view from our room which was clean & comfortable. Only a short stay (one night) but would return if we came to stay in the area again. A refreshing change from chain hotels. We are a French couple who stayed 2 nights at the Springfiled Hotel for the wedding of a friend. The hotel il a typical English hotel with very good breakfast and very welcoming tenants. Our recent stay was most enjoyable. The rooms are a good size and the bed was very comfortable with lovely pillows. The breakfast selection was wonderful and the Lady of the house is an excellent cook. We will definitely return. Stayed one weekend night to attend a relative’s celebration. Comfy bed, spacious and clean room. Wide choice for breakfast. Kevin and Elaine warm and welcoming. Kevin is the perfect host with a great sense of humour. We will definitely be back to stay when visiting relatives in Marple. Highly recommended. We are frequent stayers being grandparents visiting our family.Of course our 2 grandchildren want too stay with us as well. Always an excellent stay with our hosts coping with our grandchildren from babes in arms to 4 and 6 year olds. Thankyou for the comfortable rooms and your thoughtfulness you are a great team. See you soon a Very Happy Christmas and a Prosperous New Year. Ps your breakfasts are the best..
We’ve stayed at Springfield a couple of times it is very good location for us. It is clean, comfortable and warm. My sons love the host he’s very funny and the breakfast is fab . Good value. Thank you for another enjoyable stay at your hospitable hotel. Your breakfast continues to be one of the best we’ve enjoyed at a hotel. We look forward to returning when we are next in the area. Lovely night in this very well maintained and comfortable hotel. Great Breakfast. Clean, comfortable and welcoming. A family home feel. Very happy with our stay. Always come back to Springfield, friendly with a touch of non conformist ..... perfect. Great breakfast, good rooms, good value. Comfortable surroundings. Owners very helpful .Excellent Breakfast service.Ideally located on the edge of the beautiful Peak District yet very convenient for city shopping. Would certainly recommend. Warm welcome on arrival and throughout our stay. Excellent accommodation, clean room and comfy bed! Breakfast menu extensive and beautifully cooked. Highly recommended. Great little b & b in Marple. One of the best breakfast rooms and choices we have ever had. Accommodation was nicely appointed and is characterful. Owner and staff very friendly and helpful. Will definately stay again! We've stayed im many b&bs over the last few years. This one is in the top 5% as far as quality of breakfast is concerned. Marvellous cboice. Good clean bathroom, with large bath.Would certainly stay there again if visiting Marple. Stayed one night and very impressed. Elaine certainly exceeded my expectations going above and beyond what you expect from a host. Breakfast is excellent with lots of choice and nothing is too much trouble. Would stay again if visiting the area. Thank you Elaine for your warm welcome and help. Very friendly and clean Hotel and I enjoyed my stay. Breakfasts are excellent. Our second visit to this hotel as it is close to the people we were visiting. It is a clean and tidy small hotel with friendly proprietors. Rooms are quite spacious and nicely equipped with a comfortable bed. Breakfast has a good selection to choose from and is very good. Overall we think this hotel offers good value for money. If occasion requires further visits to Marple we won't hesitate in using this hotel again. Comfortable rooms and souroundings. Great breakfast. Ideal for business and pleasure stay. We had a very pleasant stay. The breakfast was delicious, the room was fabulous. The location was exactly what we were looking for. We would highly recommend this hotel for anyone. We enjoyed our stay at the Springfield Hotel - we stayed one night to visit family around the corner. The setup in the Family room was perfect for us as 2 adults and 2 young children and the double bed was very comfy! Elaine and Kevin were very welcoming and the breakfast the next morning was delicious and a great spread. When traveling back to Marple, we would be happy to stay there again. Warm and welcoming hosts, with a good sense of humour. Pleasant location, no traffic noise, very comfortable accommodation. Fantastic breakfast spread with top quality products. Parking on site, and in side road. Fresh towels each morning. We enjoyed our stay and do not hesitate to recommend it to other people. When we visit family again, we will stay here. A most personalised stay - lovely welcome/ room and breakfast. It was almost like we were old friends! I book this hotel regularly for colleagues visiting from USA as they love the views, the rooms and the staff and the location. Just had a new guy visit for a week and he was totally satisfied. I regularly recommend it to people I know are visiting the area. Whilst I haven't stayed there myself, I have visited and met the lovely owners. We always stay here when we see our children, who live nearby. The breakfast is great, especially as I am gluten free. Well located for Marple, Marple Bridge and trips to the Peaks and Manchester. Good size rooms with all amenities. Chatty Landlord who likes to engage in banter. Fantastic breakfasts I recommend the eggs benedict and eggs royale. Thanks Kevin see you next year. We needed accommodation for the christening. Where better to stay than The Springfield, we've stayed there before and if we can get in, we know we'll be looked after.We did and it was great again. Thank you Kevin and staff you did us proud. Vince. Fantastic stay as usual. Kevin is the perfect host and always makes your stay enjoyable. We wouldn't stay anywhere else when we visit our son and his family nearby. A lovely comfortable and freindly hotel. Thank you Kevin for raising a glass with us on the birth of our first grandson, a lovely gesture. Be back soon. We stayed here for 4 nights whilst busy redecorating our new house and were glad of a warm bed! The room was clean and shower worked well. Breakfast was a treat with plenty of selections of fresh fruit, cereals, croissants etc, and also a good selection of food from the menu including the "full English", also omelettes and plenty more! Well deserving of the slightly higher price I feel. I would rate it a 5 purely on the breakfast selections and quality alone! great breakfast,clean throughout,comfy bed and lovely hosts.What more can one say. Had a lovely three night stay. Very warm and welcoming. Clean and everything we needed. Breakfast was also lovely. Really enjoyed it and will definitely go back and recommend to others. It was a small, friendly hotel with great hospitality, nice hosts and a warm atmosphere. The breakfast had everything we’d wish for and the environment made us feel calm and comfortable. Thank you for making our stay very comfortable . We very much enjoyed the lovely fresh cooked breakfast with all the other choices . Would love to come back one day . Really enjoyed our stay in your hotel. Me and my colleague had a lovely stay at Springfields Hotel! The rooms where light and very comfortable. We where very well looked after and the breakfast was amazing. Definitely make it a pit stop if your in the area! We thoroughly enjoyed our stay at this interesting hotel It is full of character and the owners gave us a warm and friendly greeting. Comfortable beds, good TV, lots of extras and above all one of the best breakfasts I've had in any hotel, even the 5 star ones! Can't wait to comeback. A lovely hotel with a beautiful garden & parking at the back. The owners Keith & Elaine were very friendly & welcoming. Our room was cosy & very clean. Breakfast was excellent with so much choice. We will definitely return. Highly recommended. A clean and tidy hotel, with frik opoendly hosts, beautifully kept gardens, a good breakfast with plenty of choice. A lovely park opposite and a few minutes walk from the town centre. After a long walk from home along the canal The well manicured gardens of Springfields were a welcoming sight. From the outside we could tell we had chosen our stop over well, inside did not disappoint with a tidy and well presented bedroom. Breakfast in the morning was served with a smile and good humour, then we were sent out into the wilds again well rested and with warm wishes. Would thoroughly recommend a stay here. Great place to stay, very clean with excellent service. The breakfast is superb with everything you could wish for. Very friendly and helpful staff. Good carpark. Very central. The only problems we had, was that the bed was a little narrow and a little short, and the sliding door to the bathroom which couldn't be closed properly. Hi Mark. I\'m glad you enjoyed your stay. Sorry about the bed - its a standard double bed (width and length) but maybe not standard size in Denmark! I\'ll look at the door to the bathroom, so thanks for bringing that to my attention. We had a wonderful stay at the Springfield hotel, very friendly, glorious breakfast lots of choices on the menu. Would definitely stay here again and excellent value for money. Very pleasant place to stay. Great welcome and friendly hosts. Good bed and good breakfast. Now my likely place to stay before an early departure from Manchester Airport. Graet find and place to stay near to family we have in Marple. Well looked after and nothing was too much!! From the moment we arrived we felt welcome being immediately greeted by Kevin. The whole place is absolutely spotlessly clean and fresh. It is conveniently situated for any visitors and has beautiful views over the park and distant hills. Breakfast was extremely good with extensive choices of cereals, granola, yogurts, fresh fruits, nuts, croissants, preserves toast and full English breakfast! I would definitely rcommend any traveller to stay here. on Saturday, we were given a warm welcome upon arrival, our room was very nice and comfortable, breakfast was excellent, overall a lovely stay. Nice clean family room. Lovely breakfast. Friendly host. The beds for the children is a single bed with a pull out bed underneath. My only complaint really is that there is a velux window in the family room with no blind, therefore as it is June it was extremely light as dawn came and I couldn't sleep. Glad you enjoyed your stay and really sorry about the velux window and lack of a blind! I\'d completely forgotten about it so thank you for pointing it out and sorry that you didn\'t get a full nights sleep. Pleasant guest house. Clean and comfortable. Kevin was very hospitable. He accommodated our whole family for the evening to celebrate our mother's 80th birthday. Breakfast was good. Thank you. We booked this hotel to be near to our friends and were pleasantly surprised at the standard of the rooms. The variety of food on offer for breakfast was outstanding and the cooked breakfast was perfect. The good humour of the landlord was an extra bonus. My elderly mum hasn't laughed so much in ages and was delighted. A lovely hotel, with excellent facilities. Everything spotlessly clean. Superb breakfast. We particularly loved the spacious nature of the hotel, and the downstairs rooms to just sit and relax during the day, and the honesty bar in the evening. Also, the hotel was a 5 minute walk through the park into the village of Marple. Kevin, the host was a lovely person, friendly and accommodating and a font of knowledge on what to do, so thank you Kevin! We will be back! Had a great break at the springfields hotel, arrived early but that was no problem room was ready. The welcome from Kevin was great check in was quick and easy. The room was large and had all the things a 4/5 star hotel has finally the breakfast was outstanding I cannot recommend this hotel more. Very pleasant stay. Delighted that gluten free cereals were offered at breakfast time. Pleasant clean and welcoming with an amazing breakfast selection. Only downside was the heating, room was very hot and no way off lowering temperature without opening window very wide! We were on the road side so then had to contend with the noise from cars, we liviein a quite village so not the best. Visiting Mellor for a golf reunion we chose Springfield for convenience.We were not disappointed.Our room was spacious and well appointed.I enjoyed the best night's sleep in some time.Breakfast was delightful,a real 'spread'.Well done Springfield,you made us most welcome! A group of my friends stayed at the Springfield for the weekend. They raved about the breakfast and the warm welcome. Rooms were clean and comfortable and they would all definitely visit again. Thanks very much. Good sized room, excellent location from destination and owners were very friendly. Very relaxed atmosphere with a warm welcome. Friendly hosts,lovely clean room,we had the kingsize bedroom.Breakfast was excellent,i had the vegitarrian my partner had the full english,also lots of choice of fresh fruit and cereals etc.Would stay here again. We stayed in the family room. It is light Bright and spacious. Tea and coffee in the en suite room which was spotlessly clean.The breakfast menu is excellent and the food was superb and great value.Kevin the host is very friendly helpful. We will definitely stay there again. We really enjoyed our overnight stay here. Modern clean comfortable room and bed. Everything we could possibly need on hand. Friendly owners/staff and very good service. Delicious breakfast and a great choice. Lovely garden and nice views especially from the top floor. Will stay here again. Great host's, friendly warm atmosphere. Made to feel extremely welcome . lovely bright clean room with fantastic views. Breakfast was really good so much variety and freshly made. We would definitely return. Kevin is a truely excellent owner ...he makes us feel right at home and nothing is too much for him. We have stayed before and look forward to our next stopeover here. Clean,convienent for all amenaties,excellent breakfast and very friendly. I stayed over after a cycling event in Alfreton as I had another event the next day in Marple. The bed was superb, the lounge area very relaxing and the breakfast was top class. The owners were very friendly and engaging. Will definitely recommend and use in the future. Charismatic owners, lovely hotel, nice, clean and comfy room. Amazing breakfast and an honesty bar. Couldn't have wished for better, thanks. We had a very pleasant stay at The Spring Fields Hotel. Our room was clean and the bedding and towels were spotless. Breakfast was excellent,something there for everyone, including a choice of hot breakfasts. Very friendly and helpful people, made you feel very welcome. Had a great stay at Springfields Hotel with my friend. Rooms nice and clean, plenty of extra tea/coffee/milk available. Beds comfortable, and, breakfast was great. You were left to enjoy yourself, with an honesty bar available, which we helped our selves too. Kevin might seem odd at first, once you get him, he is great fun. - Spacious room, big bed and a nice sofa. - Simple but adequate bathroom. Second visit for me, and brought my son and his girlfriend this time, who agreed with me that The Springfield was very comfortable and had everything we needed. The breakfast was suoerb - everything you could want with good service. Will be back. A hidden gem, would highly recommend the hotel. Kevin & Elaine were excellent hosts, very welcoming and nothing was to much trouble. I was recommended to use the Springfields Hotel by the company I was training with as they have never had a bad experience with anyone staying there. I can see why, very relaxed atmosphere, comfortable room (En-Suite), Great breakfast too! Would happily recommend. A few nice touches in the room too, just not the usual tea and coffee. Very pleased with the standard, cleanliness etc.. Stayed for a few nights on business. All good, room was clean and breakfast selection was plentiful. I'd visit again with no hesitation. although only for one night,the stay at your hotel last weekend was very relaxing as was the atmosphere in your house. The breakfast left nothing to desire! Thank you very much. Coming back to the area means coming back to your hotel. The Springfield Hotel in Marple was a real find: comfortable accommodation, a warm welcome, and very reasonable price. The cooked breakfast was excellent. I would definitely stay here again, and can warmly recommend it. The location, within close walking distance both of Marple rail station and the town centre, is ideal. A lovely staff we really enjoyed our selves and will go back when in marple again. The view from the befroom window was super . This little hotel is a gem. Old fashioned courstey and honesty, a warm welcome and relaxing surroundings. The breakfast was fabulous! Like staying in a friends house. Very comfy beds and spacious rooms. Breakfast delicious. Would definitely recommend. Clean and comfortable accommodation with good facilities. If you're looking for a clean, friendly hotel in Marple - look no further - you've found it!! Its brilliant, the rooms are a treat to stay in and the breakfast is truly first class. As for Kevin, the owner, you've got to meet him - his humour is awesome! C'mon, what are you waiting for - get booking!! I can't recommend this hotel enough. Wonderful place to stay felt like home. Widest range of breakfast I've ever seen. Lovely comfortable bed . We had 2 double en-suite rooms, travelling with my husband and adult son. Kevin was welcoming and went out of his way to ensure we had everything we needed. The rooms were lovely; clean, comfortable with everything that you would expect of a four star hotel, at least. The breakfast was a highlight, with many choices from full English to fruit, yogurts, pastries and excellent coffee! I thoroughly recommend The Springfield Hotel and hope we have occasion in the future to stay again! Only stayed one night to attend a family function but really enjoyed our stay. The room was nice and clean with very comfy beds. Breakfast was lovely with plenty of choice and the "full English" was very tasty and not at all greasy. Kevin was a genial host. Would definitely stay there again if we were in the area. Characterful house with winding nooks and crannies to enjoy. Delightful breakfast. This is an older building, and, like us all, shows acceptable signs of the ageing process, but the owners keep it in a very comfortable condition. It is not the Ritz, and benefits from that. Kevin and Elaine have a very relaxed attitude which immediately makes one feel at home, even before arrival. The 'honesty' bar is a fantastic idea. But, even better than the general ambiance is the great choice, and quality of the breakfast, served with lashings of Kevin's dry humour and local knowledge. It's not every day you are hosted by a published author. My husband and I stayed for 1 night here and it was welcoming, comfy and the breakfast was amazing. Will be staying here again most definitely. An excellent place to stay - a clean, comfortable room and a shining bathroom with plenty of hot water and towels. There was a choice on the breakfast menu and my cooked breakfast was well presented and very satisfying. I shall certainly stay at Springfields again when I am in the area. Bedrooms a little dated but clean and tidy, nice breakfast excellent host. I would like to thank Kevin and Elaine for a lovely stay, the rooms are clean and spacious and very nice en suite bathroom. Braekfast if great and I highly recommend the Springfield Hotel. Excellent stay for a weekend. Very comfy, well equipped room, helpful and entertaining host and good breakfast. What more do you need. We all agreed we'd stay there again. Very clean, comfortable room. Friendly proprietor. Excellent breakfast spread and food. Good base for walking. If you need a quiet, relaxing stay this is the place. Great little place to stay... I was traveling on business and would usually use one of the branded mid budget hotels.. but this was close to where I needed to be and I am glad I chose it.. clean, comfortable room, great breakfast and hospitable host.. what more do you need! en-suite. Breakfast was superb with lots of choice and Carol was very welcoming. Would recommend hotel and would stay again if in the area. Comfortable, clean and excellent service. Wonderful breakfast! Stayed one night only to attend a funeral. 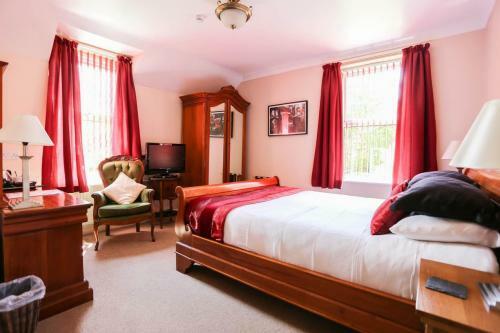 Welcome laid back atmosphere,extremely comfortable bed and a wonderful cooked breakfast. We would definitely stay again. A lovely welcoming hotel, great hospitality, wonderful staff. My room had everything I could ask for. I will be staying here again an again. Kevin was the perfect host. We stayed at the Springfields Hotel for one night when we came to our Grand Daughter's Christmas play at the local school. The hotel was perfect for our needs - comfortable, quiet and with excellent facilities and food. The breakfast was delicious with a huge choice of everything. We could not have wished for a better stay. Thanks for a really relaxing stay. You made it easy for us to check in and breakfast couldn't have been better. Great banter also our thanks go to you and your staff! My mother and I stayed for one night at the Springfield Hotel. We were made very welcome by Kevin who was a very good host. Our room was very comfortable, with everything we needed. Bathroom clean and warm. Enjoyed our breakfast, lots of choice both on the menu and in the cereals (fruit, yoghurt etc.) Next time we come to Marple to visit relatives we will definitely stay at the Springfield. Very helpfull and room upgraded at no extra cost, fantastic breakfast that set us up for the long day ahead.Just a shame that it was a short stay but we will stay with you when we head back that way. Enjoyed my stay, double ensuite , lovely hot water for my evening bath, good shower, clean facilities , warm surroundings , comfortable bed. Highlight was the breakfast good healthy selection of fruit, cereal, yogurts and even selection juices, toast was nicely trimmed, owners were friendly would recommend , thank you. Great little Hotel run by very friendly people. Comfy rooms with all the basics. Breakfast was EXCELLENT! :-) Would definitely stay again if in the area. Nice rooms, good breakfast, friendly atmosphere. Friendly welcome, comfortable stay and lovely breakfast. Met by Kevin on arrival who was very helpful and welcoming. Didn't use any of the facilities except breakfast which was the best I have seen in any hotel. On the down side, couldn't connect to Wi-Fi on any of four items in the room. Would definitely stay there again, Thank you. Clean and tidy hotel. Nice to see a choice between the sterile one off products or more environmental friendly large bottles to share. Cleaners tidied our towels rather than replaced them for a two night stay which gets my approval (who uses a towel once At home but expects clean ones everyday in a hotel?) lovely breakfast and unlimited room tea coffee. We stayed for one night for a friends wedding. We had a fabulous nights sleep and a brilliant breakfast the next day. Thank you very much! Very comfortable stay. Excellent breakfast. Flexible check in was great for us, travelling from afar and attending a wedding. Would recommend. I booked in the Hotel as a base while attending a friends birthday dinner. Due to an accident on the motorway i was running late but the Hotel contacted me to see I was ok and then went out of their way to ensureI was looked after. My bedroom was smart, well set out and very clean - and the bed very comfortable. The following morning I had an excellent breakfast in a well equipped breakfast room. I am happy to recommend this Hotel. Thank you for taking the time to write a review. It is very much appreciated! Hope your journey home was better than the journey you had getting here! I stayed for two nights. The room was clean, the bed comfortable and the bedding spotless. Tea and coffee-making facilities were provided. The dining room was modern and the breakfast menu was comprehensive and catered for all tastes. I had the full English breakfast which was perfectly cooked. Checking in and out procedures were efficient and Kevin was friendly and hospitable. I would definitely book in to this hotel in the future. Comfortable & welcoming. High quality breakfast, cooked individually just as we asked. Had a very pleasant one night stay in this small, welcoming family run hotel. Our bedroom was spacious, furnished to a high standard and with a generous sized and well appointed bathroom. There were comfortable reception rooms downstairs including a well-stocked library and an honesty bar. The breakfast was equal to what you would expect to find in a four star hotel, extensive choice between English and Continental. Would defintiely recommend this hotel for good value and quality. A lovely friendly and very comfortable hotel. We were made to feel at home and I loved the "honesty bar". Will definately be staying here everytime we visit family up north. We were very impressed with our nights stay. Welcoming, comfortable and an excellent breakfast. Will certainly stay again. Beautiful room, very comfortable bed. En-suite facilities first class. Wish there had been time to explore the bookshelves. Great breakfast, didn't need lunch today. Hope to stay again & will definitely recommend Springfields. This was my second visit and have to say excellent host's and very comfortable and spacious room (Room 5). The breakfast again was legendary and both visits we consistently great. Comfortable bed, great breakfast with massive choice, lots of books and DVDs to borrow and a friendly, relaxed atmosphere. And some very well-maintained gardens to relax in. Very relaxed stay. Owners very hospitable. It had been a while since I had stayed in a proper British B&B and I had a lovely stay. Lots of quirky little touches around the hotel such as a hat collection and tea sets, good comfortable warm bed and very nice breakfast, with a good selection. The hotel also had an honesty bar which we enjoyed into the small hours. I would definitely stay again if I was visiting the Marple area. I had a very comfortable stay at the Springfield hotel., the host was welcoming and went out of his way to make me feel at home. Once again a very comfortable stay, breakfast excellent with a wide variety well presented and attentive service. Spent 2 very comfortable nights in this delightful B and B. Friendly welcome and great amenities, room quiet and warm. Close to village centre and good restaurants. Superb breakfast. Will certainly stay here again. Good value for money. The Springfield Hotel is a little gem. The presentation of the rooms is outstanding, and the owner Kevin charismatic conversation. The visually pleasing rooms and their extreme comfort was an unexpected delight. I only wished I had had more time to enjoy my stay. Highly recommended. We stopped here for just one night, though I would love to stay longer, the welcome was great, with some good tips on where to get dinner. The room was spacious and airy, and the bed was very comfortable had a great nights sleep in it, (as well as 40 winks not long after arriving)the bathroom was super, plenty of towels and amenities. The following morning breakfast was good, a choice of cereal, fruits, danish pastries, and numerous other cold breakfast buffet items, then we had the cooked breakfast which was definitely made from good ingredients, the bacon was the best I have had in a hotel, if you are looking for somewhere to stay this is a great place and we will hopefully get the chance to stay again in the future. very good service received. Lovely breakfast. Good sized rooms and very comfy bed! would recommend this hotel - very friendly and welcoming. A lovely welcome, a clean and comfortable room and satisfying breakfast to send me on my way - I can certainly recommend The Springfields Hotel to you and would certainly return should I be in the area. good location, close to town centre and the famous flight of canal locks. Very nice clean room with comfortable bed. Good breakfast. Comfortable room. Bathroom could have been bigger but ok. Breakfast was very good and plenty of it. I would use it again if I was staying in the area. Fantastic hotel with very friendly, welcoming staff. Excellent breakfast too! We enjoyed a one night stay at Springfield. The room was a good size, clean and the bed was lovely and comfy. Bathroom, again was clean and well stocked with towels etc. We stayed in Room 4 which overlooked the main road, which we found a littl noisy but this is in the context of living at the end of a very quiet cul-de-sac so we are unused to any traffic noice at night. Breakfast was plentiful with a good range of juice, cereal etc. Hot items were freshly cooked to order and the scrambled eggs and smoked salmon was gorgeous. All in all a very plesant stay, we appreciated being able to come and go as we pleased. The only slight improvement I could suggest would have been a full length mirror in the room. Lovely hotel.Absolutely superb bed. Breakfast was so varied. A great experience. We much enjoyed our 3-night stay. Our room was very comfortable and spotlessly clean. Breakfast was excellent with loads of choice, and set us up for the day. Kevin went out of his way to be a good and helpful host. Would certainly stay at the Springfield again. We received a warm welcome on arrival, our room was clean, nicely decorated and furnished. Our room was at the back of the hotel with views to the hills in the distance. The bed was comfortable and we slept really well. There was a great choice for breakfast from cooked to cereals to fresh fruit and juices. Overall a lovely place to stay in a beautiful area, thank you. A very nice hotel, conveniently located, with a friendly owner, and good breakfast. Ideally suited for our city break, the hotel was warm and welcoming. Service was superb and it felt like nothing would have been too much trouble. The room was clean and beds comfortable. Breakfast was of a very high quality and generous. We will return here. Very friendly atmosphere, comfortable room and a great breakfast. Would recommend to all. 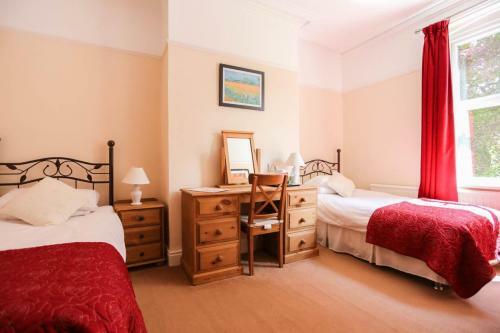 Friendly owners in this comfortable B&B in a lovely peaceful location. Breakfast was fresh and tasty. The proprietors were warm and welcoming, our double room was very comfortable, the ensuite well equipped and all spotlessly clean. The breakfast was excellent - choice of cereals, yogurts and fresh fruits plus choice of a range of cooked foods. Car park, guest lounge and informal 'honesty box' bar available as well! Would thoroughly recommend. Very pleasant stay. On arrival I thought that the noise from the road would be a problem but in the event it did not disturb me. Comfortable bed in a clean and well furnished room. Breakfast excellent. Will certainly return. Really enjoyed my stay. Hotel very clean, staff friendly and helpful. Plenty of choice for breakfast and lots of it! House keeping excellent. As travelling on my own as a female felt very relaxed and at home. Thank you. We were looking for a place to stay, which was a reasonable taxi ride to the Peruga Restaurant, where we were attending a Wedding Celebbration. Once we'd worked out how to get in (din't read the notice properly - my fault), we found this small hotel to be well appointed and clean and we found the recommended VIP Taxi's prompt and reasonable too. Kevin was warm and friendly at breakfast, with just the right amount of humour for a couple suffering from a surfeit of ale on the brain! Our room was very clean and everything worked too, so all in all a fine experience and one we would repeat next time we return home to a celebration with family and friends in the Stockport area. This is a good, mid-price, small local hotel. The rooms are clean, and have reasonable quality fittings, and the breakfast was excellent. The owners were very helpful, even volunteering to drive us to a local wedding when a taxi was unavailable. If you're looking for 5 star boutique hotel luxury, then this isn't for you, but it hits the intended market well. We stayed at Springfield Hotel for a wedding that took place at All Saints Church in Marple. We had two rooms, one for me, my wife and our youngest daughter and another for our eldest daughter and her husband. The rooms were clean and fitted with quality furnishings. The general feel was that of a home from home, rather than a posh hotel, which for us was welcome and enabled us to relax very quickly. The owners are extremely friendly, but not in an overpowering way. They seem like just naturally nice people. The breakfast selection was very impressive, especially for such a small establishment. The full English breakfast was very well cooked and not at all greasy. The chef clearly has a lot of experience with home cooking and takes pride in the details. I'd definitely recommend Springfield for a relaxing and friendly place to stay, in the heart of some fantastic landscapes. I have stayed at Springfield Hotel on two occasions and have found both to be very pleasant experiences. With its friendly staff and comfortable surroundings, it's an ideal place to stay for both work and leisure. Highly recommended. We had a great time and would have given 5 stars if Kevin hadnt forgotten the toast!! We thought it was very good value for money and Kevin & Elaine were very congenial hosts. Hope to seen you again next year and have a drink with you. The owner was very welcoming and helpful. The room was very comfortable and well decorated. The bathroom was well decorated and had a bath as well as a shower. The breakfast room was well appointed and pleasant . The buffet was comprehensive and the hot food was cooked to order and used local produce. We will definitely return. I recently stayed at Springfield Hotel and have to say that I could not fault the place. The service was fantastic and it was so nice to arrive and feel so welcomed (even at 10pm!). I will definitely stay there again. Very friendly owners, nice clean room, comfortable, good shower, nice breakfast. Stayed with my sister in March 2012. Thoroughly enjoyed the 4 nights stay. tastefully furnished, fresh flowers everywhere, many new books available for use by guests, beautiful gardens etc. Convenient to transport links, short walk into the Village. Comfortable overnight stay. Thank you. Very comfortable and quiet room. We found the Springfield to be cosy friendly, clean and tidy, but with a lovely ambiance that is lacking in larger places, which can often feel clinical. The room was excellent, the breakfast spread superb, in fact we would have become very fat indeed if we had stayed any longer. We would heartily reccommend the Springfield to any of our friends. But on the other hand we don't want too many people to know about it, or else there may not be room for us next time! We both enjoyed the stay. Hotel very ewll equipped & comfortable.Surprised it only a2-star. Did miss breakfast though which was a shame.Rooms lovely & pleasant. Bed very comfy.Wanted to bring the mattress home wit us!Would stay again if in that neck of the woods. What a find! An excellent hotel, spotlessly clean, easy parking and a great breakfast. Highly recommended all round. A clear five star rating. Lying on the western hills of the Pennines where Derbyshire and Cheshire meet, Mellor is an interesting mixture of moorland and parkland golf. Magnificent views across the Cheshire plain and Derbyshire hills serve as a backdrop for a course to test the skills of all golfers at all levels. The opening holes although not long provide an immediate examination of shotmaking ability and are set amongst mixed woodland including oak and elegant silver birch. Holes seven to twelve now assume the true moorland character and the golfer who plays to his handicap on these challenging holes will be well satisfied. Visitors and Societies find a welcoming and friendly atmosphere at New Mills Golf Club. 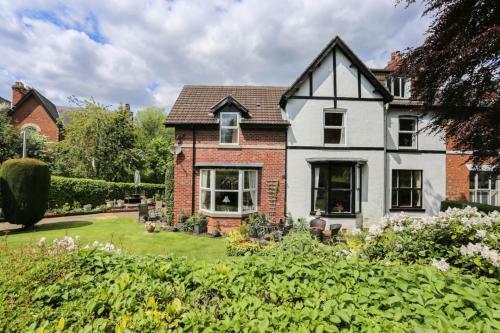 The location is renowned for its natural beauty and affords panoramic views of the Cheshire Plain and beyond to the Welsh mountains in the west. Kinder Scout, the highest mountain in the Peak District, provides a dramatic backdrop to the course in the east. The course was established in 1907 and comprises 18 holes, with long and short game practice areas. The original 9 holes is complemented by a further 9 holes which opened in Spring 2002, providing a challenging course for all golfers. The Anson Engine Museum is located on the site of the old Anson Colliery at Poynton, near Stockport, Cheshire in the UK. The main building houses a large collection of engines all maintained in running order ranging from very early Crossley gas engines through to more modern diesels. The collection covers the entire life so far of the internal combustion engine with examples of every major development on display. Power for the museum is generated onsite by a Gardner 4L2, a Ruston 5YE and a Crossley BW4. Work is progressing on the new building, to be named the Les Cawley Memorial Building. The large Hornsby gas engine is now erected and has been turned over on air. Along with a number of other larger engines it will be housed in a new building waiting to be erected alongside the Stott.